The next season of Pimp My Ride should be filmed here! It’s my last day in Peru so I thought I would create a list of Peruvian cultural quirks for you. 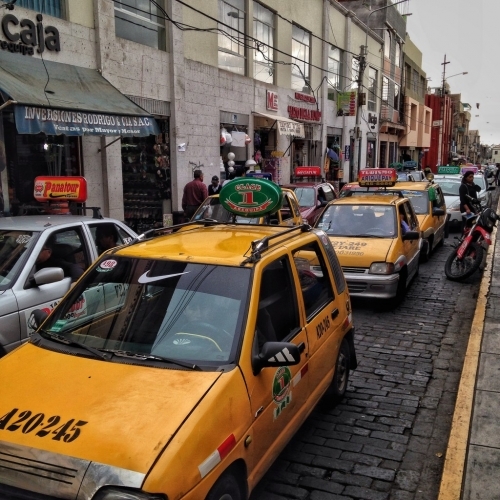 The people in Peru were extremely friendly and welcoming, however, like most South American countries, there were some Peruvian cultural quirks that I found very interesting. Enjoy! 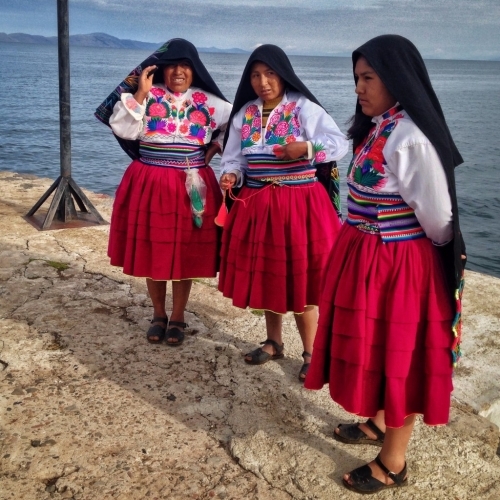 These traditional clothes worn by Quechua women are a mixture of styles from Pre-Spanish days and Spanish Colonial peasant dress. From the style and design of their clothes you can tell what community the women come from and if they are married or not. The black sandals that they wear are made from recycled truck tyres! Maria, I didn’t say that you could borrow my polleras! 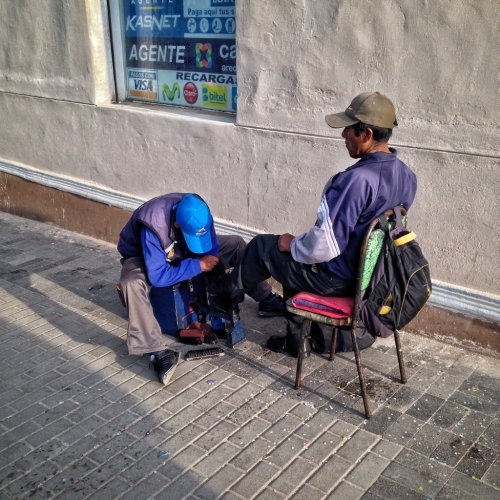 The streets are lined with these men poised to shine your shoes for a small fee. I don’t even own any shoes that require shining on my backpacking expedition so I couldn’t give these guys any business. 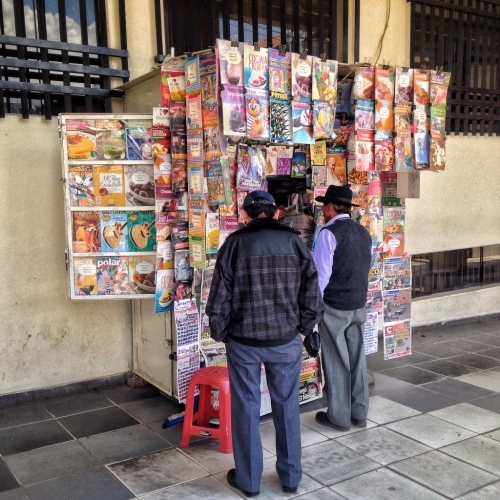 It’s been a long time since I saw one of these selling newspapers and magazines on the streets. It’s usually the older generation who still buy physical media here which give you the feeling of stepping back in time! Have you got the latest edition of MAD magazine in yet? I think they should film the next season of Pimp My Ride here, there are some really cool designs around. 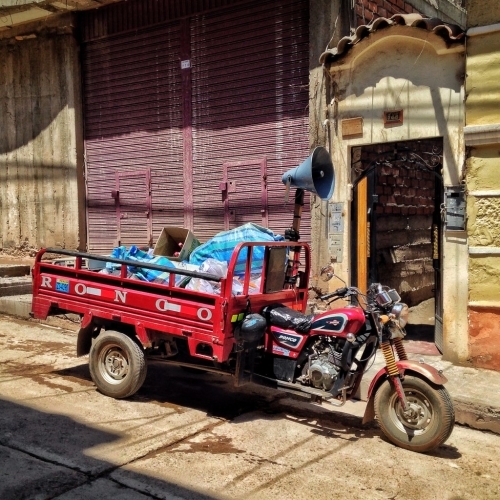 The mototaxis are covered to protect customers from the torrential rains in Peru’s wet season. They did a good job here, although the Nike symbol is backwards! 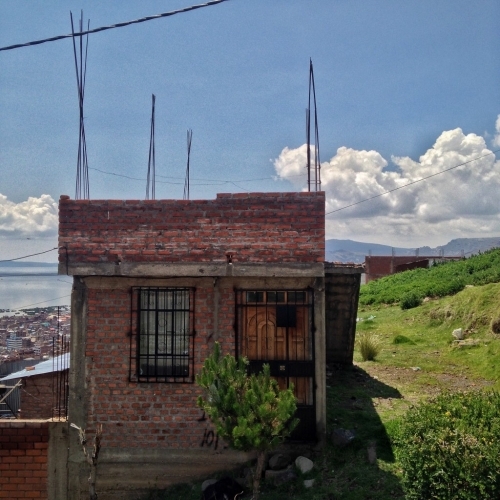 Every house in Peru seems to be unfinished. I thought this was a really weird Peruvian cultural quirk until I Googled the answer and discovered it’s a loop hole in the taxation laws. Residents don’t have to pay property tax until construction is complete, well played Peruvians! I think they are expecting to add on another level for their grandchildren. 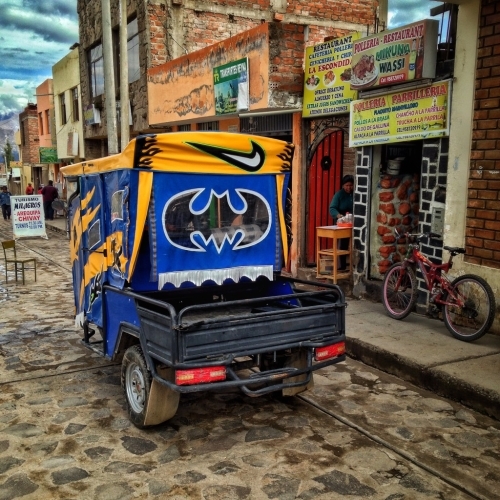 Men drive around the streets of Peru advertising themselves via a loud speaker, wanting to collect any scrap metal or electrical appliances. I’ve seen this cultural quirk before in the UK with Gypsies. Bring out your dead… I mean, bring out your dead electrical devices! 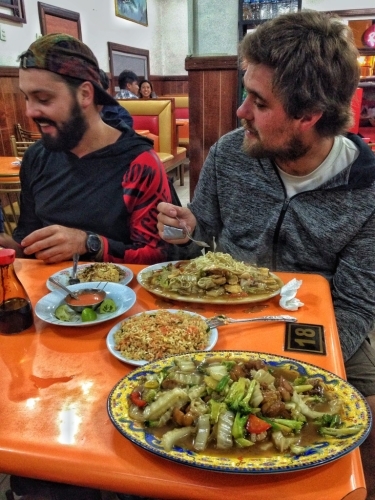 Peruvian Chinese, who would have thought it existed? It’s cheap, tasty and the portions are huge! Portions so big the gravy was spilling off the plate! Taxi’s will always beep you when passing just to check if you need a lift it scares the s*it out of you! If I needed a lift I will put my hand out and hail you! It’s not like I am walking along and a driver beeps me then all of a sudden I remember I needed to catch a taxi! If I need a taxi I’ll hail one! Every country that I’ve been to that is not a native English speaking has had some poorly translated sign or menu. 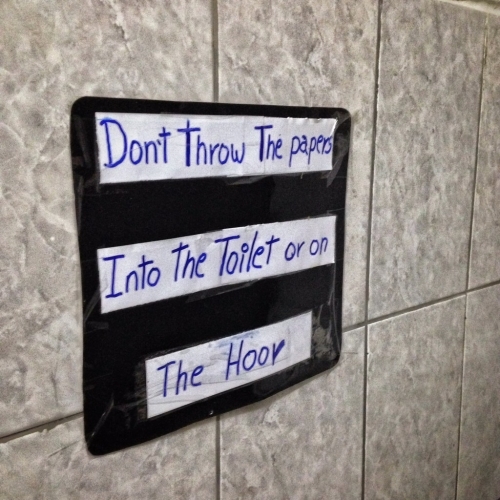 Peru is no exception to the rule, check out this sign I found in a lavatory! 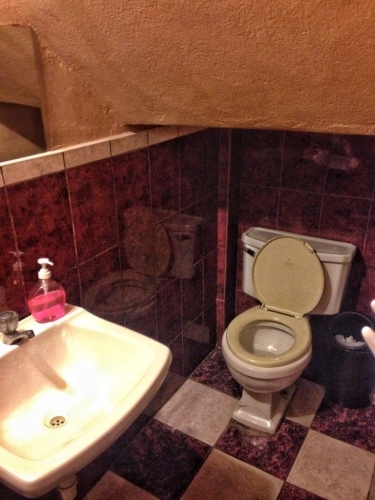 There’s always limited space in most hostels but the Peruvians have taken space usage to another level. So many times I have hit my head on a staircase because they have squeezed in a toilet under the stairs! Don’t forget to flush and mind your head in the process! Have you ever been to a store that just sells one thing? 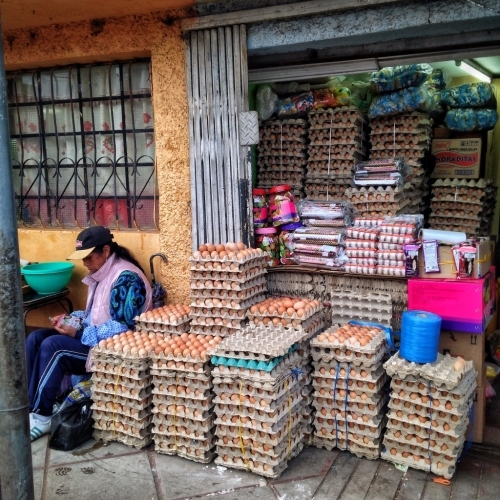 Well another Peruvian cultural quirk is that they have a store that just sells eggs, dozens upon dozens of stacked egg cartons! I thought it was an eggscellent idea! 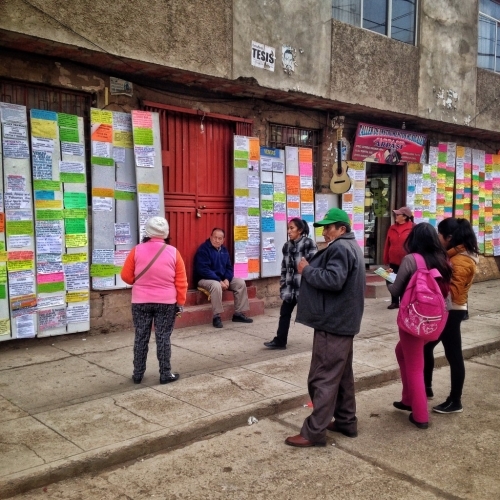 There are either no online bulletin boards in the smaller towns of Peru or the residents prefer to stand around browsing hundreds of messages. 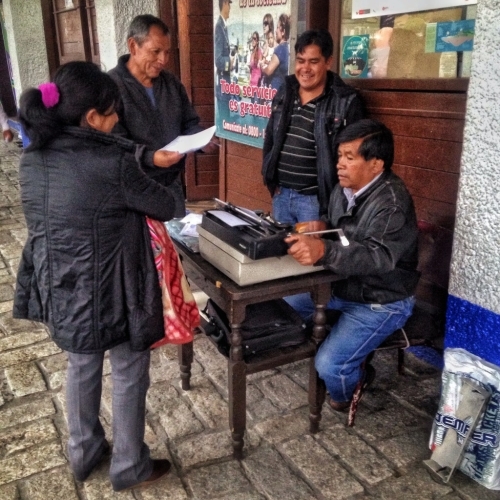 This was a corner on one of the main streets of Puno which had properties listed for rent. The shy and quiet Guinea Pig, I remember a lot of my friends had them as pets growing up in Australia. 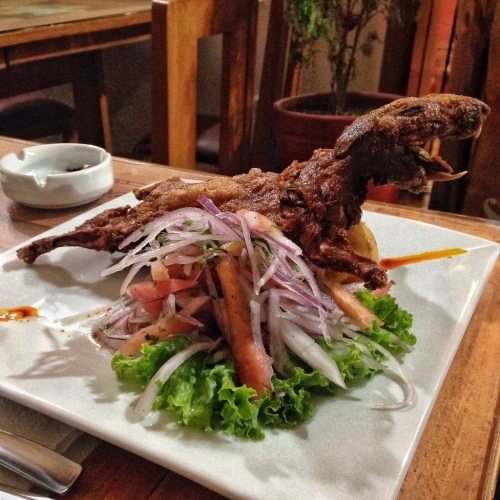 Well in Peru they are not pets but considered food! However, the black Guinea Pigs are spared death in that they are used by Shamans to cure illness. The Shamans allow the Guinea Pig to crawl over the patient and diagnose the problem, after which the Shaman rubs the animal on the affected area of the patient which cures the illness. To all the vegetarians out there, I am truly sorry! There is a very small amount of meat on a Guinea Pig. It’s like eating Quail. Need an official document typed up and you don’t know how to use a computer? There’s always a typist on standby who will type up anything that you dictate to him. It reminded me of the Teleprompter fail scene from the movie the Anchorman where Ron Burgundy reads exactly what’s on the Teleprompter even though it is not politically correct! How do you spell Chlamydia sir? 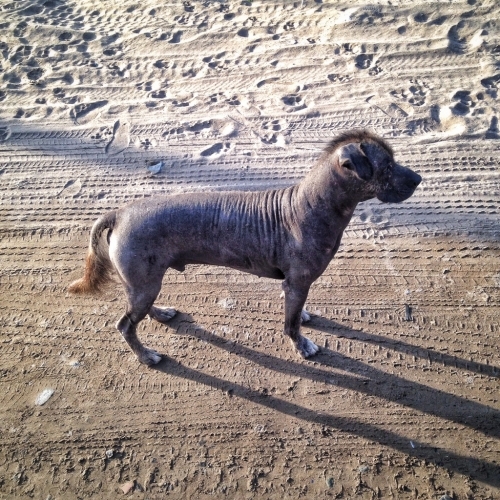 The Peruvian Hairless dog has to be the ugliest dog on the planet! They used to be valued for their medicinal purposes as it was believed they could relieve arthritis and other aches and pains. The ugliest dogs in the world, would you want this used to treat you?!?! If you know of any more Peruvian cultural quirks then please comment below to share your experiences!! Hey Andrew, we met a while ago in Medellin. I really love your traveling adventures. We are trying to meet my best friend Gina for part of her travelings to South America. We don’t have that much time, so we are only going for two weeks to Peru. I was wondering if you did the Inca Trails. Or if you recommend something else. Any little tips about places that we must see while there please let me know, I would really appreciated it since we have just limited time. Keep up the good work, really good and inspiring blog.